We are near the end of a 10 day trip though Brazil. 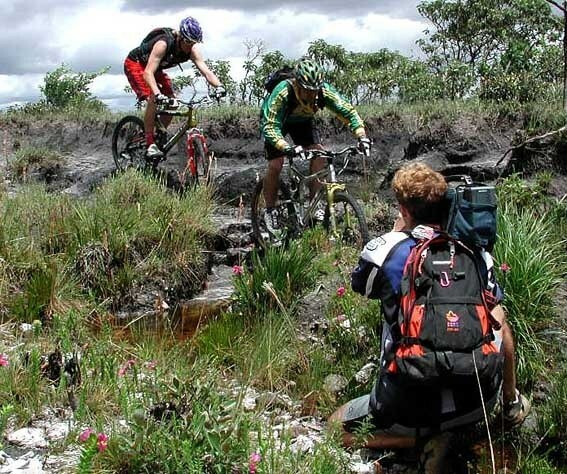 Following an invitation of our friends from Pedal Power, the Brazilian Rockshox distributor, to come to their country to check out the biking scene and some of their greatest trails, sites as well as test the new 2002 RockShox products. 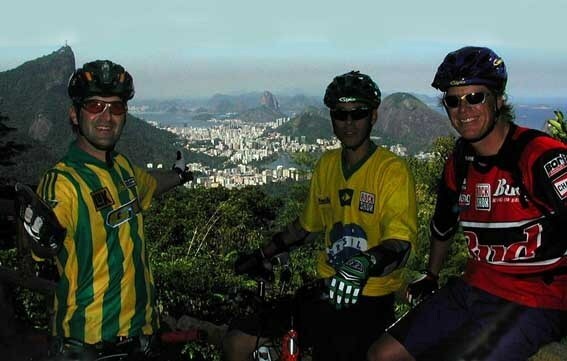 This RockShox Explorer trip consisted of Greg Herbold former Downhill World Champion and my partner in crime in the classic movie Tread; as well as local honch, Bobby Nogueira , who is one of Brazils ambassadors of freeriding. We were followed by a couple of film crews (this footage will be seen on TV in over 80 countries…. 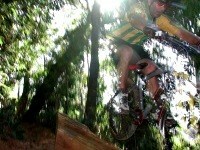 ); and RockShox’ photographer and marketing man – Dirk Belling. The three of us started out in Sao Paulo (17 million inhabitants), from there we headed to Belo Horizonte (3 million inhabitants) and then into the Minas Gerais Mountains. After a 4 hour road trip we arrived in a small village (250 inhabitants) in the middle of nowhere, where we stayed in a simple but beautiful lakefront lodge. After a few problems with my Visa (what? – you need a Visa to go to Brazil?) I met my pals on the trails of the Minas, which are covered with crystals, all of them needing to be inspected by Hans. It feels great to test some new products without ten layers of clothes! 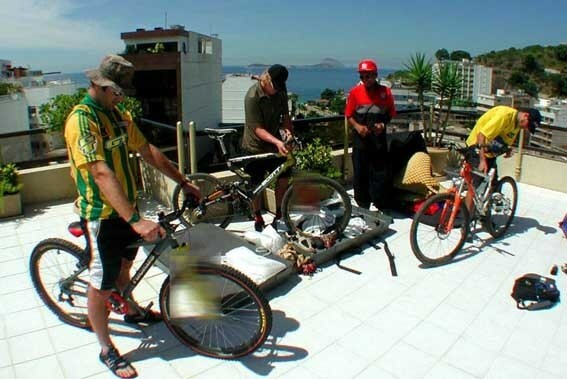 Rio had some amazing riding action and we got to shred the local downhill course with mounted video cameras. The beach action had venders supplying us with everything we needed: fresh shrimp, cerveza, chairs and umbrellas, even gifts for our chicks, and the most beautiful girls I have ever seen in one place. Back at Sao Paulo we went to a MTB race in the local mountains. 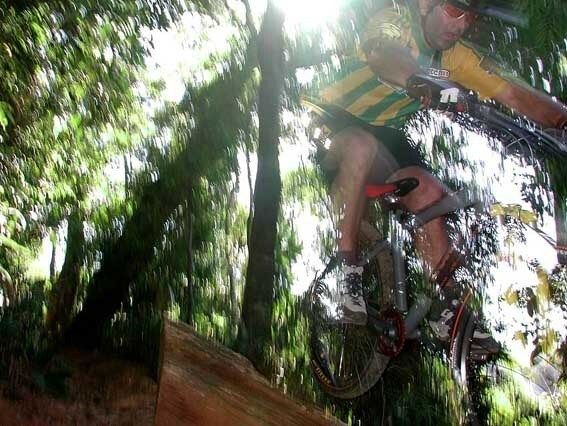 It reminded me of racing in the USA in the late 80’s, especially after getting roosted by old guys with rigid bikes, toe clips, and thumb shifters. 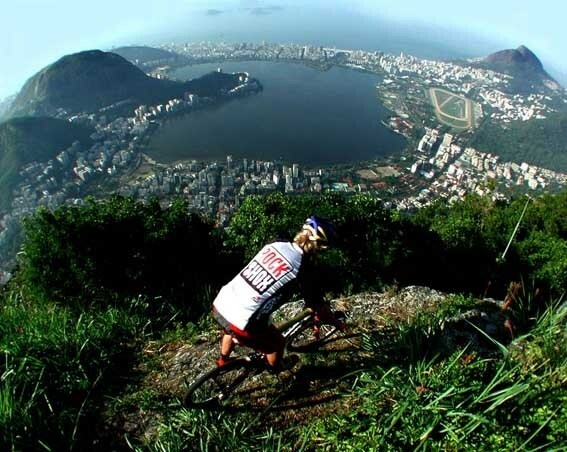 All the riders in Brazil are very nice and excited to meet us. And did I say that there are incredible women here? The urban riding with the locals is fun as well, and we did our fair share hopping and dropping at night.